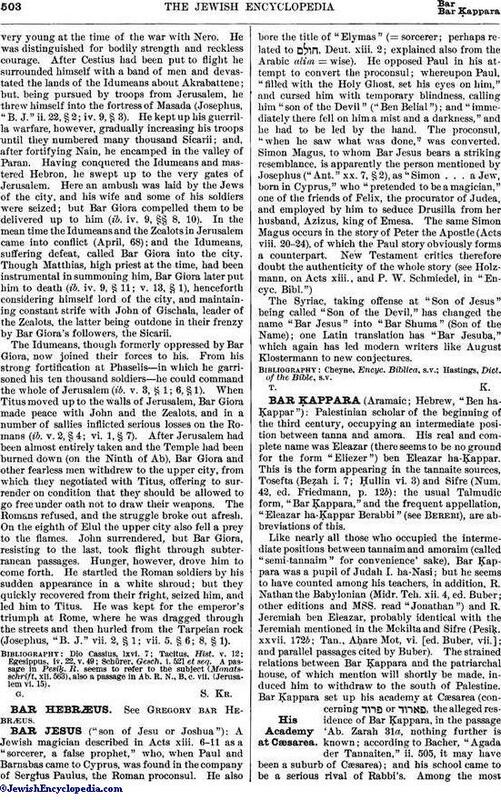 Like nearly all those who occupied the intermediate positions between tannaim and amoraim (called "semi-tannaim" for convenience' sake), Bar Ḳappara was a pupil of Judah I. ha-Nasi; but he seems to have counted among his teachers, in addition, R. Nathan the Babylonian (Midr. Teh. xii. 4, ed. Buber; other editions and MSS. read "Jonathan") and R. Jeremiah ben Eleazar, probably identical with the Jeremiah mentioned in the Mekilta and Sifre (Pesiḳ. xxvii. 172b; Tan., Aḥare Mot, vi. [ed. Buber, vii. ]; and parallel passages cited by Buber). The strained relations between Bar Ḳappara and the patriarchal house, of which mention will shortly be made, induced him to withdraw to the south of Palestine. Bar Ḳappara set up his academy at Cæsarea (concerning or , the alleged residence of Bar Ḳappara, in the passage 'Ab. 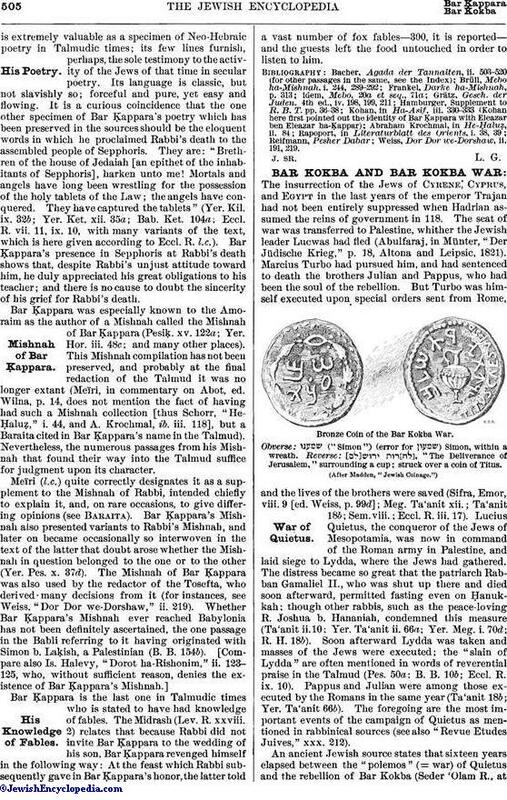 Zarah 31a, nothing further is known; according to Bacher, "Agada der Tannaiten," ii. 505, it may have been a suburb of Cæsarea); and his school came to be a serious rival of Rabbi's. Among the mostimportant of its scholars were Hoshayah, "the father of the Mishnah" (Ker. 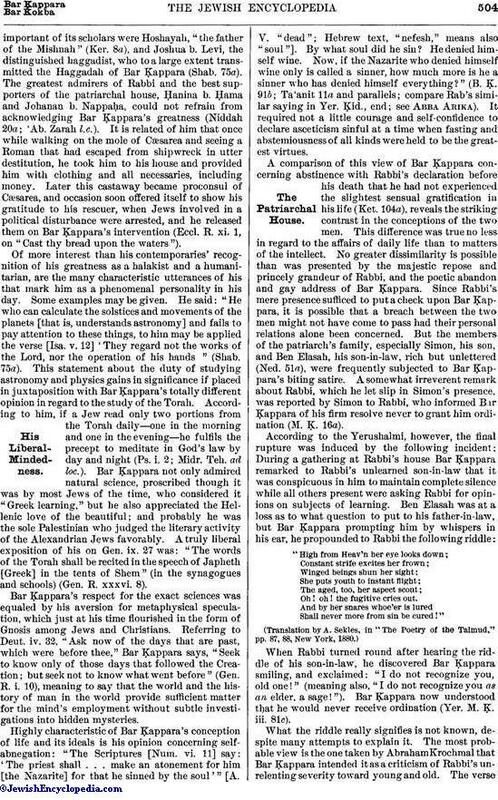 8a), and Joshua b. Levi, the distinguished haggadist, who to a large extent transmitted the Haggadah of Bar Ḳappara (Shab. 75a). The greatest admirers of Rabbi and the best supporters of the patriarchal house, Ḥanina b. Ḥama and Johanan b. Nappaḥa, could not refrain from acknowledging Bar Ḳappara's greatness (Niddah 20a; 'Ab. Zarah l.c.). It is related of him that once while walking on the mole of Cæsarea and seeing a Roman that had escaped from shipwreck in utter destitution, he took him to his house and provided him with clothing and all necessaries, including money. Later this castaway became proconsul of Cæsarea, and occasion soon offered itself to show his gratitude to his rescuer, when Jews involved in a political disturbance were arrested, and he released them on Bar Ḳappara's intervention (Eccl. R. xi. 1, on "Cast thy bread upon the waters").